The blanket is gorgeous. And I can certainly see how the bears feel although I imagine they are enjoying thinking about a new brother. It’s going to be Boy City at your house! Ah, that is a beautiful blanket! You are very blessed to have such a personal gift handmade for you and that little one. karen is quite talented…what a nice keepsake for you & baby(ies)! what a gorgeous blanket, karen! well done! i knit baby blankets, so i appreciate the time that went into this beautiful creation! what a treasure for baby! Aw! What a cute blanket—- best part?! Made with TONS and TONS of LOVE, I’m sure! I love the snuggly blanket! I love those colors and the knit. Wonderful job, Karen! 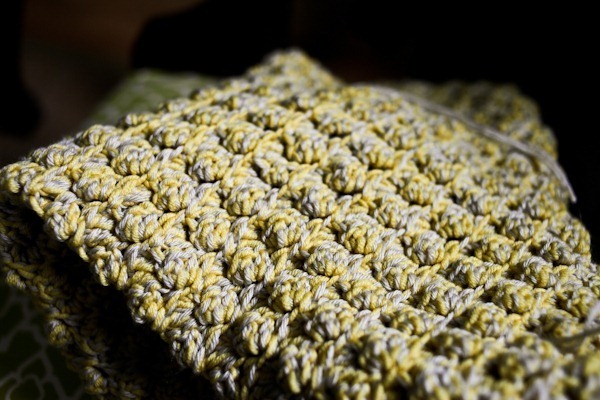 that crocheted blanket is gorgeous! and I love the color! Love the blanket pattern. Would Karen share the stitch/pattern she is using? Hi! I noticed on your BBT chart, you ovulated in the mid 20s of your cycle…do they make the due date later since its past the “typical” day 14? I have longer cycles since going off BC and ovulate around cycle day 28 on average. With my daughter, I knew that my O date was a few days late and the first ultrasound confirmed this, but they still based my due date on my LMP. So when I got to my due date still pregnant, there was some pressure to induce, but I knew that I was not actually “late.” Of course, my daughter ended up coming naturally on her REAL due date. So if you end up going past your LMP due date, just remind them you are not really late. 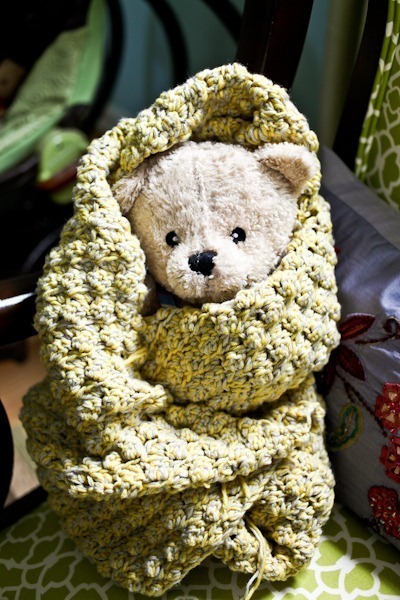 Such a sweet blanket and bear-wrapped shot; great handiwork, Karen! Aww looks like such a nice snuggly blanket. How sweet of her! What a great blankie! Beautiful! Love the grey & yellow combo in a blanket.